Alfred A. Knopf Books for Young Readers, 9780375836794, 40pp. A hilarious guide to having a dinosaur . . . as a pet! Dogs are delightful. Cats are cute. And fish are fun. But the best pet of all is . . . a DINOSAUR! But how do you pick the dino that’s right for you? Spiky? Armored? Humongous? Pea-brained? Plant-eater? How do you take care of him once he’s (gulp!) home? How do you feed him, exercise him, take him to the vet, and give him a bath?! Not to mention train him, since he might like to chew on—er, swallow—Mom’s new shoes. 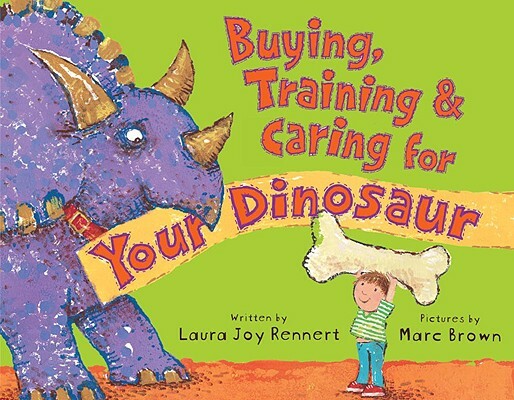 Full of little-known info and sage advice, this definitive guide to dino ownership is sure to thrill and delight kids everywhere! Laura Joy Rennert is a literary agent who lives in California with her husband and daughter. This is her first book. Marc Brown has received numerous accolades for his illustrations for "Wild About Books "and "Born to Read, "by Judy Sierra, and is the beloved creator of the books and TV show about Arthur the aardvark. He lives in Martha's Vineyard and New York City. Review, Booklist: "This starter guide will come in handy, whether kids are in the market for a new fantasy pet or just a fun read-aloud ....Youngsters will quickly become absorbed in this enjoyable mix of facts, fantasy, and fossils." Review, Kirkus Reviews: "From dino descriptions to basic commands—"STAY (Ha! )"—to exercising your dino and taking it to school, it's a cheery descendant of Bernard Most's classic If the Dinosaurs Came Back (1978)." Review, School Library Journal: "[Marc] Brown helps the cause with ... some of his best illustrations to date. His overly enthusiastic, sweet-faced, humongous patterned dinosaurs are ... irresistibly delicious." Review, Palo Alto Weekly: "Kids love dinosaurs. Yet with 16,000 dinosaur books already on the market, is there any need for a new one? Yep, when it's as clever and eye-poppingly colorful as this, by Palo Alto author Laura Rennert, illustrated by Marc Brown ("Arthur"). All the popular dinosaur species are described according to their attributes as household pets. There are tips on purchasing a dino and traveling with one. And for playing—because as all kids know, 'Dinos are for fun!'" Review, Austin American-Statesman: "The warm, witty Buying, Training & Caring for Your Dinosaur apes a training manual for kids who have a new "little" friend as a pet...Illustrator Marc Brown, the creator of the Arthur books that inspired the PBS show of the same name, experimented with a new technique for the book's illustrations—monoprinting, a printmaking style that creates singular images more like paintings. Vibrant color choices keep the mood light, as befits the concept: After all, it's not every dinosaur book that reminds us about pteranodon's long fourth finger, which is 'perfect for removing unnecessary broccoli from dinner plates.'"